15 watt; A21 LED; 5000K; medium base; 240' beam spread; 120 volts; 100W equivalent. Approved for enclosed fixtures. Damp location rated. CRI: 80. ANSI Base: E26; Initial lumens: 1500; kelvin temp: 5000. MOL: 5 1/4"; MOD: 2 3/8"; Average rated hou rs: 15000. Natural light color; 4 per pack, 4 packs per case. 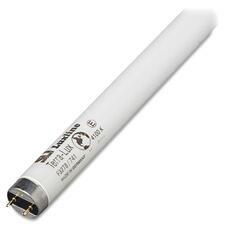 11 watt; A19 LED; 2700K; medium base; 240' beam spread; 120 volts; 75W equivalent. Approved for enclosed fixtures. Damp location rated. Warm white color. ANSI Base: E26; Initial lumens: 1100; kelvin temp: 2700. MOL: 4 5/8"; MOD: 2 3/8"; Average ra ted hours: 15000. CRI: 80; 4 per pack, 4 packs per case. 11 watt; A19 LED; 5000K; medium base; 240' beam spread; 120 volts; 75W equivalent. Approved for enclosed fixtures. Damp location rated. ANSI Base: E26; Initial lumens: 1150; kelvin temp: 5000. MOL: 4 5/8"; MOD: 2 3/8"; Average rated hours: 15000. Natural light color CRI: 80; 4 per pack, 4 packs per case. 15 watt; A21 LED; 2700K; medium base; 240' beam spread; 120 volts; 100W equivalent. Approved for enclosed fixtures. Damp location rated. ANSI Base: E26; Initial lumens: 1500; kelvin temp: 2700. MOL: 5 1/4"; MOD: 2 3/8"; Average rated hours: 15000. Warm white color CRI: 80; 4 per pack, 4 packs per case. 53 watt. Energy saving halogen. Bright, crisp light. Uniform light output. Soft white. Medium base. ANSI base E26. RoHS Compliant. Voltage: 120; Average rated hours: 1000. Initial lumens: 1050; Kelvin temp: 3000. 72 watt. Energy saving halogen. Bright, crisp light. Uniform light output. Clear. Medium base. ANSI base E26. RoHS Compliant. Voltage: 120; Average rated hours: 1000. Initial lumens: 1490; Kelvin temp: 3000. 72 watt. Energy saving halogen. Bright, crisp light. Uniform light output. Soft white. Medium base. ANSI base E26. RoHS Compliant. Voltage: 120; Average rated hours: 1000. Initial lumens: 1490; Kelvin temp: 3000. 70 watt. Energy saving halogen. Bright, crisp light. Uniform light output. Medium skirted base. ANSI base E26SK. RoHS Compliant. Clear finish. Voltage: 120; Initial lumens: 1380; Filament: CC-8. Average rated hours: 1500; Kelvin temp: 300. 150 watt. Uniform light distribution. Superior performance. High efficiency. Pulse start. Open rated. Medium base. ANSI base E26. Clear finish. CRI: 65; Initial lumens: 14000. Average rated hours: 15000; Kelvin temp: 4000. 13 watt. Self-ballasted spiral CFL. Uses 75% less energy than equivalent incandescent lamps. Long life. Instant on. Medium base. E26 ANSI base. CRI 82. Incandescent equivalent: 60W; Voltage: 120. Average rated hours: 12000; Kelvin temp: 4100. 4 per pack, 12 packs per case. 10 watt. A-shaped replacement lamp. Long life. Dimmable. 215' beam spread. Medium base. Frosted finish. Medium base. ANSI base E26. Warm white. Voltage: 120; CRI: 80; Initial lumens: 800. Average rated hours: 25000; Kelvin temp: 2700. 11 watt. Solid state LED lighting. Reflector replacement lamp. Long life. Dimmable. Medium base. ANSI base E26. Energy Star. 108' beam spread. Voltage: 120; CRI: 80; Initial lumens: 800. Average rated hours: 25000; Kelvin temp: 3000. High performance and efficiency. TCLP compliant. Meets RoHS standards. Medium Bi-Pin base. MOD in inches: 1"; MOL in inches: 35.78". 25 watt; 75 CRI; Average Rated Hours: 20000. Nominal Length: 36". Initial lumens: 2150; Mean lumens: 2040. 30 p er case. High efficiency. DLC qualified. Meets RoHS standards. Medium Bi-Pin base. MOD in inches: 1"; MOL in inches: 48". ANSI base: G13. 14 watt; 82 CRI; Average Rated Hours: 50000. Initial lumens: 1800; Beam spread Deg: 230. General Service Reflector. Household or Commercial Use. Long life. Brass base. 65 watt. Frost finish. 2500 average rated hours. 580 lumens. Medium base. Dimmable; 120 volts; RoHS Compliant; Filament CC-6. MOL in inches: 6 1/2"; ANSI base: E26 . 10 watt. Dimmable. Medium base. ANSI base E26. Energy Star. 100' beam spread. Voltage: 120; CRI: 80; Initial lumens: 700. Average rated hours: 25000; Kelvin temp: 2700. 8.5 watt. Dimmable. Medium base. ANSI base E26. Energy Star. 106' beam spread. Voltage: 120; CRI: 80; Initial lumens: 650. Average rated hours: 25000; Kelvin temp: 2700. 20 watt. Miniature 2 pin round base. Bright, crisp light. UV-filter halogen capsule. Uniform light output. 12 volt. GU5.3/GX5.3 ANSI base. ANSI Code: BAB; Kelvin Temp: 2900. Average rated hours: 4000; Color: Warm white. 53 watt. Energy saving halogen. Bright, crisp light. Uniform light output. Clear. Medium base. ANSI base E26. RoHS Compliant. Voltage: 120; Average rated hours: 1000. Initial lumens: 1050; Kelvin temp: 3000. 39 watt. Energy saving halogen. Bright, crisp light. Uniform light output. Medium base. ANSI base E26. RoHS Compliant. Clear finish. Beam spread Deg: 34. Voltage: 120; Initial lumens: 530; Filament: CC-8. Average rated hours: 1500; Kelvin temp: 2900; Dimmable. Warm white; 15 per case. 60 watt. Energy saving halogen. Bright, crisp light. Uniform light output. Medium skirted base. ANSI base E26SK. RoHS Compliant. Clear finish. Voltage: 120; Initial lumens: 1090; Filament: CC-8. Average rated hours: 1500; Kelvin temp: 300. 80 watt. Energy saving halogen. Bright, crisp light. Uniform light output. Medium skirted base. ANSI base E26SK. RoHS Compliant. Clear finish. Voltage: 120; Initial lumens: 1600; Filament: CC-8. Average rated hours: 1500; Kelvin temp: 3050. 100 watt. General service reflector. Household or commercial use. Long life. Brass base. Medium base. ANSI base E26. Voltage: 120; Filament: CC-9; RoHS Compliant. Average rated hours: 2000. 400 watt. Uniform light distribution. Superior performance. High efficiency. Mogul base. ANSI base E39. Clear finish. Universal burning position. CRI: 65; Initial lumens: 36000; RoHS Compliant. Average rated hours: 20000; Kelvin temp: 4200. 50 watt. Uniform light distribution. Superior performance. High efficiency. Medium base. ANSI base E26. Clear finish. Universal burning position. CRI: 65; Initial lumens: 3800; RoHS Compliant. Average rated hours: 6000; Kelvin temp: 4000. 15 watt. Self-ballasted spiral CFL. Uses 75% less energy than equivalent incandescent lamps. Long life. Instant on. Medium base. E26 ANSI base. CRI 82. Incandescent equivalent: 75W; Voltage: 120. Average rated hours: 10000; Kelvin temp: 4100K. 18 watt. Self-ballasted spiral CFL. Uses 75% less energy than equivalent incandescent lamps. Long life. Instant on. Medium base. E26 ANSI base. CRI 82. Incandescent equivalent: 75W; Voltage: 120. Average rated hours: 10000; Kelvin temp: 4100. 4 per pack, 12 packs per case. 23 watt. Self-ballasted spiral CFL. Uses 75% less energy than equivalent incandescent lamps. Long life. Instant on. Medium base. E26 ANSI base. CRI 82. 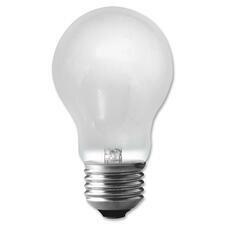 Incandescent equivalent: 100W; Voltage: 120. Average rated hours: 12000; Kelvin temp: 4100. 3 per pack, 12 packs per case. Professional grade. Program/instant start. Low/medium/high ballast factor. Number of lamps: 4; F32T8; T8 Instant Start. Wiring method: leads; Power Factor: 10. 15 watt. Solid state LED lighting. Reflector replacement lamp. Long life. Dimmable. Medium base. ANSI base E26. Energy Star. 40' beam spread. Voltage: 120; CRI: 80; Initial lumens: 1150. Average rated hours: 25000; Kelvin temp: 3000. 9 watt. Solid state LED lighting. Long life. Non-dimmable. Medium base. ANSI base E26. 200' beam spread. 60w equivalent. Frost finish. Voltage: 120; CRI: 80; Initial lumens: 800. Average rated hours: 10000; Kelvin temp: 2700. 9 watt. Solid state LED lighting. Long life. Non-dimmable. Medium base. ANSI base E26. 200' beam spread. 60w equivalent. Frost finish. Voltage: 120; CRI: 80; Initial lumens: 800. Average rated hours: 10000; Kelvin temp: 5000. Professional grade fluorescent lamp. Meets RoHS standards. Medium Bi-Pin base. MOD in inches: 1.50"; MOL in inches: 23.78". 20 watt; 62 CRI; Average Rated Hours: 9000. Nominal Length: 24". Initial lumens: 1220; 30 per case. Professional grade fluorescent lamp. Meets RoHS standards. Medium Bi-Pin base. MOD in inches: 1.50"; MOL in inches: 47.78". 40 watt; 87 CRI; Average Rated Hours: 20000. Nominal Length: 48". Initial lumens: 2150; 30 per case. 13 watt, pin-based, 2700K, 82 CRI, G24Q-1 (4-Pin) base. Non-integrated pin based CFL. Uses 75% less energy than equivalent incandescent lamps. Initial lumens: 900; Average rated hours: 15000. Kelvin temp: 2700. 13 watt, pin-based, 3500K, 82 CRI, G23-2 base. Non-integrated pin based CFL. Uses 75% less energy than equivalent incandescent lamps. Neutral white color. Initial lumens: 780; Average rated hours: 12000. Kelvin temp: 3500. 18 watt, pin-based, 2700K, 82 CRI, G24Q-2 (4-Pin) base. Non-integrated pin based CFL. Uses 75% less energy than equivalent incandescent lamps. Initial lumens: 1250; Average rated hours: 15000. Kelvin temp: 2700. 9 watt, pin-based, 3500K, 82 CRI, G23-2 base. Non-integrated pin based CFL. Uses 75% less energy than equivalent incandescent lamps. Natural white color. Initial lumens: 525; Average rated hours: 12000. Kelvin temp: 3500. Non-integrated pin based CFL/ Uses 75% less energy than equivalent incandescent lamps. TCLP Compliant for low mercury. Meets RoHS standards. 32 watt; 82 CRI; Average Rated Hours: 12000. 120 Volt; 3500 Kelvin Temp; Initial lumens: 2400. Base: GX24q-3 (4-pin); 50 per case. Non-integrated pin based CFL. Uses 75% less energy than equivalent incandescent lamps. TCLP compliant for low mercury. Meets RoHS standards. 26 watts; ANSI base: G24q-3; 82 CRI. MOL in inches: 6 1/2"; Initial lumens: 1825; Warm White. Average Rated Hours: 15000; Kelvin temp: 2700; 50 per pack. High performance and efficiency. TCLP compliant. Meets RoHS standards. Miniature Bi-Pin base. MOD in inches: 0.63"; MOL in inches: 22.2". 14 watt; 85 CRI; Average Rated Hours: 24000. Nominal Length: 24". Initial lumens: 1350; Mean lumens: 1250; 40 per case. High performance and efficiency. TCLP compliant. Meets RoHS standards. Medium Bi-Pin base. MOD in inches: 1"; MOL in inches: 47.78". 32 watt; 85 CRI; Average Rated Hours: 24000. Nominal Length: 48". Initial lumens: 2900; Mean lumens: 2750; 30 pe r case. High efficiency. DLC qualified. Meets RoHS standards. Medium Bi-Pin base. MOD in inches: 1"; MOL in inches: 36". ANSI base: G13. 11 watt; 82 CRI; Average Rated Hours: 50000. Initial lumens: 1450; Beam spread Deg: 230. T12 Rapid Start Flourescent Bulb 36"